Siemens is to make a £27 million investment in a new, state-of-the-art manufacturing facility for Worcester-based Materials Solutions Ltd; its additive manufacturing, or 3D printing specialist. The new building, set to open in September 2018, will enable it to increase its fleet of 3D printing machines from 15 to 50 over the next five years. It represents a major investment by Siemens in this rapidly advancing and innovative technology. The new factory will be fully powered by Siemens Digital Enterprise technologies solutions, an end-to-end portfolio comprising software-based systems and automation components which cover every conceivable requirement arising along the industrial value chain and therefore harness the potential of digitalisation. The location for the new facility will be the Worcester Six Business Park Development which is host to manufacturing, offices, R&D and logistics buildings. 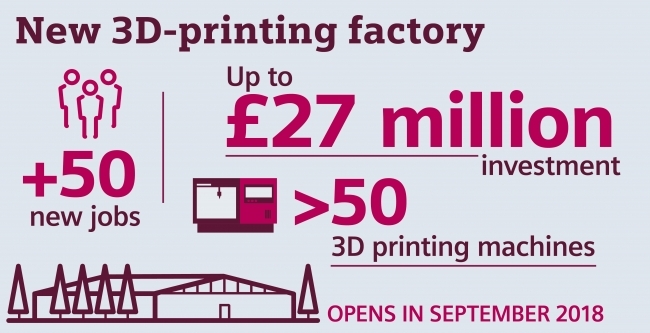 The expansion of the business is also expected to support the creation of around 55 high quality new jobs, increasing Materials Solutions’ team of world class engineers, metallurgists and manufacturing specialists to 80 – and making it a global centre of excellence within the Additive Manufacturing sector. The new facility will also be a focal point for collaboration between Materials Solutions and the already sizable UK Siemens Digital Factory division. Materials Solutions, also offers comprehensive services for engineering and printing up to the complete manufacturing of parts for the aviation industry, the automotive industry, power generation and motor sports. The new facility will be a global centre of excellence for the business, and act as the launch pad for its global growth plans. Siemens acquired a majority stake (85 percent) in Materials Solutions Ltd in 2016. The business is a pioneer in the use of Selective Laser Melting (SLM) technology for the manufacture of high-performance metal parts and has grown its business considerably over the last two years. Juergen Maier recently led the Made Smarter review for Government on behalf of industry in the UK. 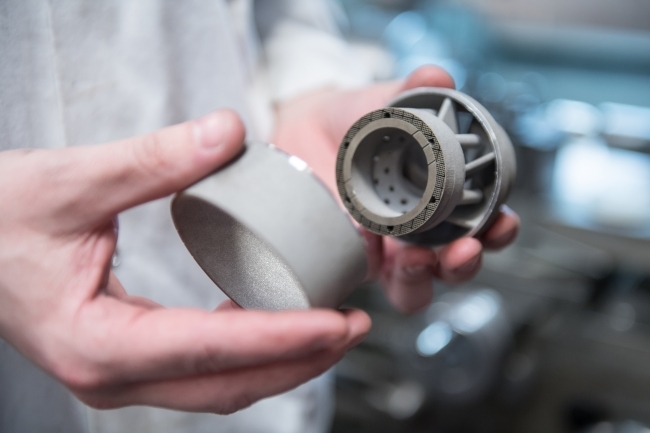 The in-depth review which forms part of the UK industrial strategy called for much greater national investment in additive manufacturing, arguing it will significantly boost industrial productivity and create new highly skilled jobs. Business Secretary Greg Clark concluded: “Britain has a proud manufacturing heritage and through our Industrial Strategy the Government has set out a vision and plan that will build on this strength and create an environment that enables manufacturers to continue to thrive. The investment being made by Siemens into UK advanced manufacturing demonstrates the confidence businesses have in the strategy. Founded in 2006, Materials Solutions is a pioneer in the use of Selective Laser Melting (SLM) technology for the manufacture of high-performance metal parts, with a focus on high-temperature super alloys. As a result, it has developed proven applications, know-how and a supply chain for some of the world’s most advanced engineering companies operating in a broad range of industries. The company also works closely with Siemens’ Power & Gas Division and it is anticipated that, thanks to its expanded footprint, it will manufacture thousands of parts for use in Siemens power generation equipment over the coming years.